Jesus is still risen today. And next week. And next month. And in November. That's what I've been thinking about today. The mourning and waiting and celebrating really are what make Easter matter, but they also exist in our everyday life. That's what I want to remember on this Monday after the celebrating and proclaiming and praising. I gave up worshiping Productivity for Lent. And, honestly, I feel like God changed me in those 46 days. I don't say that to be dramatic, but because not bowing down to my to-do list created with much-too-high expectations is a process God has had me on. For years. So, obviously, I'm not a totally different person in six and a half weeks, but I'm less stressed and less hurried because God taught me some things. My days are less defined by my production. I've laid down my to-do list for relationships. I've set aside what I thought I needed to do for my friend who needed some help and encouragement. I've gotten plenty done in what's a busy season, but I've enjoyed my life in the process. I'm embracing a one-thing-at-a-time approach. Yes, I write things down on my calendar that's usually in my purse, but I cross them off when I can. Sure, some days I rushed around and spoke harsher in the hurry, but those moments have been less. And I've realized God's given me perspective to balance my natural tendencies. I've demanded less of myself so I can have more of God. For someone who has crammed too much into her calendar for far too long, it's quite appropriate I ended the Lenten season on my the back porch of our lake house with a fiction book, good food, my family, and my best friend's family. The view there gives peace to my soul, regardless of whatever is happening in real life. "Christ continually shouts through the universe, 'You have a love that is already yours. You have nothing to prove to anyone. You have nothing to prove to Me. You are significant and preapproved and utterly cherished. Not because you are good, but because are you are Mine.' ... This is what God does, this God of all glory and dominion who reaches down with a holy hand to lift our chins and turn our eyes toward the Son, so we may look full in His wonderful face and 'forget ourselves.'" Isn't that what the Easter message is really about? As I let God deeper into my life, I remember Jesus is enough. Who I am because of what he endured on a cross and how he shocked the world by rising again is what should define my days. I'm linking this post with Jen Ferguson's Soli Deo Gloria party, Jennifer Dukes Lee's #TellHisStory and Beth Stiff's Three Word Wednesday. You are a brave soul with your example of Lenten observances. Demanding less of self to have more of God and giving up worshiping Productivity for Lent. I have been attempting to give up anxiety and frustration the last couple of years as giving up food no longer affected me as it use to. Well so far I am failing miserably thus my need to have the chance to read the Love Idol and the gift of always being PreApproved! Blessings Dear Kristin for sharing your heart in this post. Thanks for your kind words, Marie! I hope God continues reminding you that his approval is enough. I can so relate to this worship of productivity. Sometimes I just pick out the longest line and stop and watch the sunset when I am already running late, just to remind myself that He matters more. Perhaps a controversial figure, but I remember listening to an interview of Heidi Baker and how with each orphanage and expansion of ministry she spent more time in prayer... not more time doing. Sometimes people would go without answers to what they thought to be important questions, but she just knew time with God mattered most. 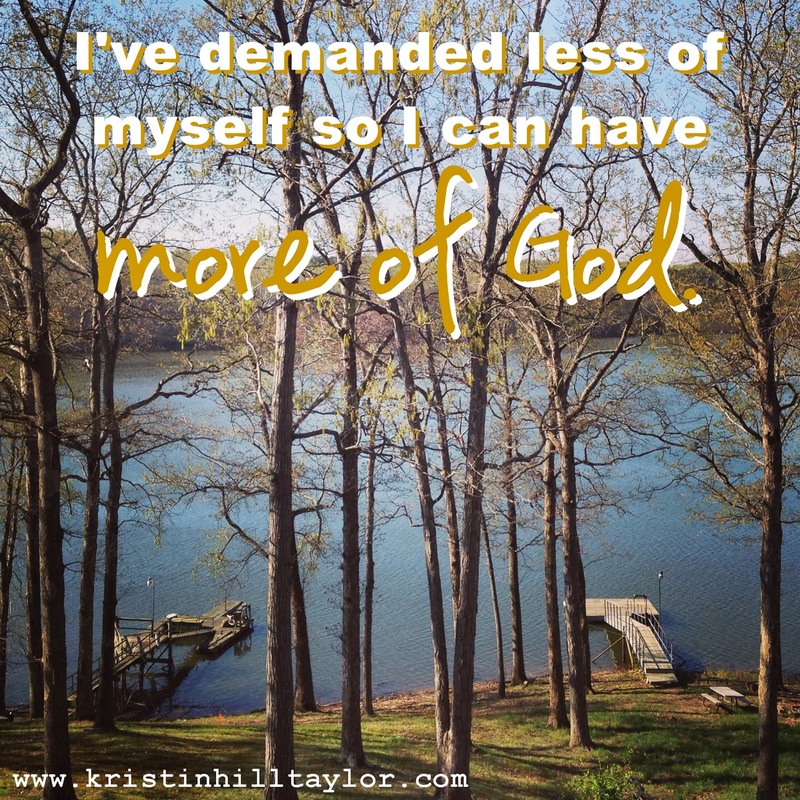 I loved this line: I've demanded less of myself so I can have more of God. "I've demanded less of myself so I can have more of God." This is a great quote. One I should print out and read aloud EVERY day. It's good to see you here, Amanda! I really love the idea of intentionally pausing and stopping the rush to think about God. God's been repeating it over and over to me so I'm glad you can benefit from those words too! Thanks for coming by and commenting, Amy! It's been so wonderful to follow along your journey. While my Lenten journey didn't end the way I had intended, I know God's plans for me are far greater than anything I can imagine and He is changing this heart of mine. I simply can't wait for our time together. Love you. Truthfully, I'm not sure any Lenten journey goes as we expect. :) The takeaways from mine weren't what I was expecting either, but God honed in on what I've had a hard time learning in recent years. It's definitely all part of a larger, longer process. Much love to you! And I've loved journeying with you. Thanks for trusting God with your words and inspiring a movement.